Here in East Anglia we don’t do winters well. There’s rarely snow and our mild sea climate denies us those crisp, bright winter mornings that I remember from my northern childhood. For us, winter is a sustained and oppressive greyness, amplified by our big skies which press down upon us like a felt blanket. It’s a relief to see the back of it when spring arrives. Our neighbours have a magnolia tree which I’ve come to see as Spring’s over-eager messenger. 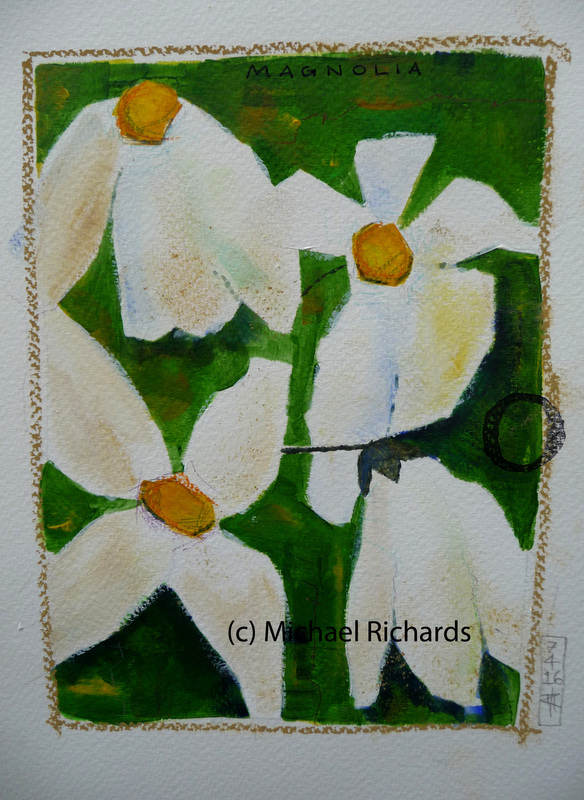 Earlier and earlier it starts to bud, sometimes so early that we often wonder if a frost will damage it, but a few weeks later those buds turn into lovely white ragged flowers, like torn strips of paper or discarded handkerchiefs, and then you know that spring is close at hand. Daffodils are so much a part of the British spring that’s it’s odd to remember that they’re not native flowers at all, but originally southern European, possibly Greek. They were introduced to northern gardens by Dutch bulb traders. Now they’re everywhere: not only in gardens, but surrounding public buildings, scattered through woodlands and even brightening up roundabouts along with discarded plastic bottles and home-made signs wishing someone a happy 50th birthday. Bees are already in evidence, especially those plump bumble bees woozily searching for a place to nest and give birth to a whole new colony. There are fewer each year however, and our dismal government has ensured this trend will continue by authorising the use of neonicotinoid pesticides. Whether it’s straightforward stupidity or some slavish commitment to a free market economy the result is the same – a spring with ever fewer bees to polinate the plants and trees that not only brighten our days but make our world habitable. 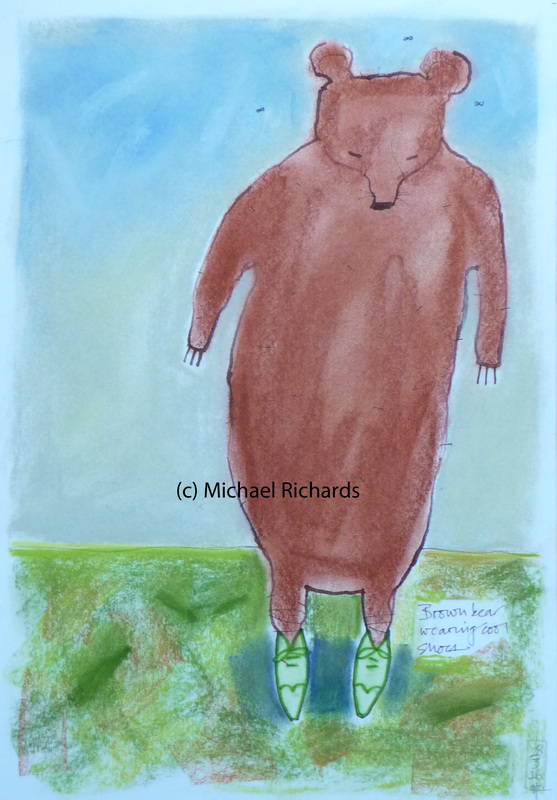 Put them all together and you have a brown bear in cool shoes. 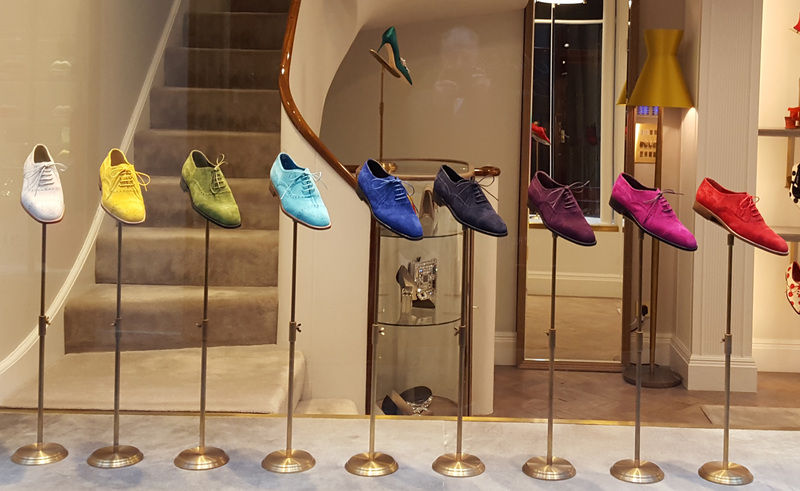 PS When I win the lottery, and I can enter shops that don’t have prices on items in the window display without fear of humiliation, I’m going to treat myself to those lime green suede brogues third from the left. They represent the height of frivolous materialism to me and the exactly the sort of thing you should wear when you’re eight million pounds richer overnight (after that you can start doing good deeds). A colleague of mine once sent me an SMS to say that he’d seen Simon Schama in the Nordic Cafe in London in something like the ones pictured fifth from the left, so I’ll be in good company. …Autumn, that is. It has been, we’re told, a bumper year for apples in the U.K. Well, not in our garden, I’m afraid. These three represent the extent of nature’s bounty in our corner of Suffolk: a Blenheim Orange, a Russet, and an Elstar. 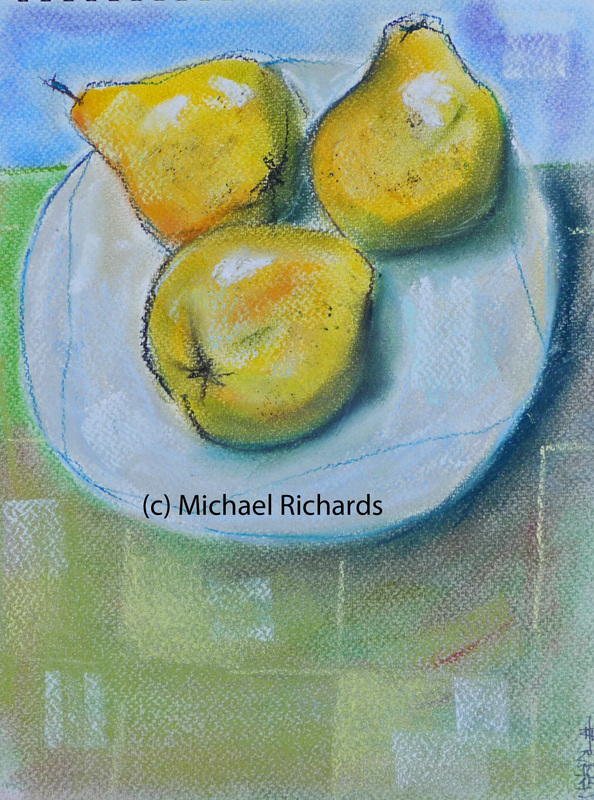 The mildly interesting thing about this little pastel drawing is that I positioned them with the biggest at the back and the smallest at the front. The result being that the perspective looks flattened, an effect I find very pleasing in others. 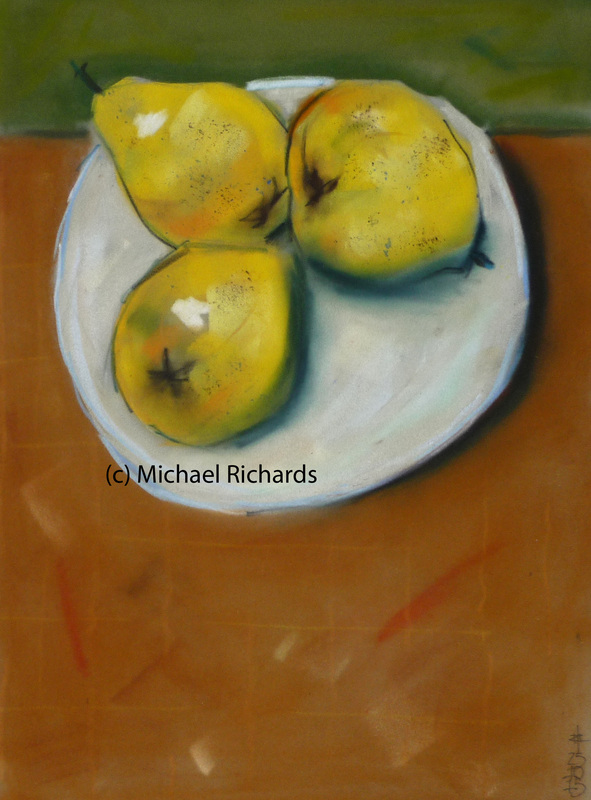 One of the many things I discovered on Ed Cooper’s inspiring oil painting course was to see objects as blocks of colour and tone, rather than an outline filled with colour. That’s probably glaringly obvious if you went to art college, but something that needs to be understood if you didn’t (I didn’t). The outlines here, such as they are, were added later, as design elements almost. 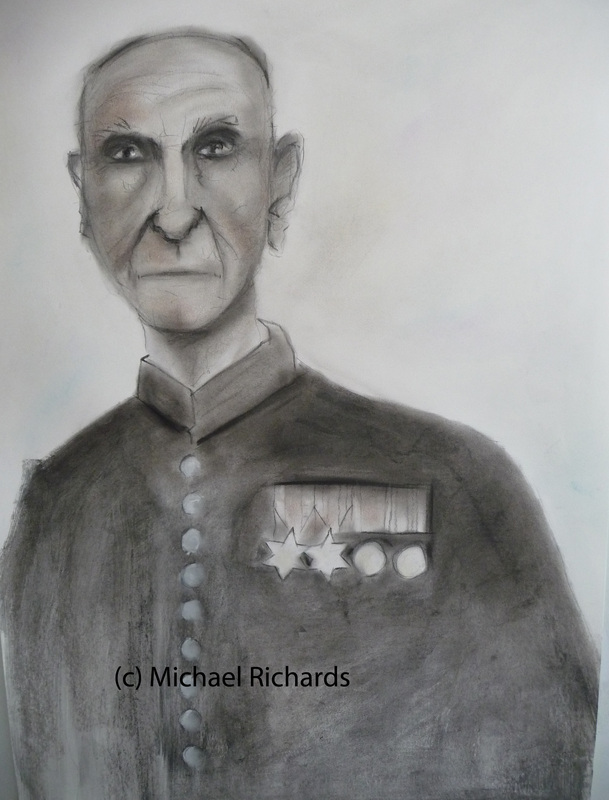 Inspired, no doubt, by Doug Selway’s exhibition, Shelf Lives – which looked movingly at aspects of memory and story-telling – I thought I’d draw someone with a vivid history. 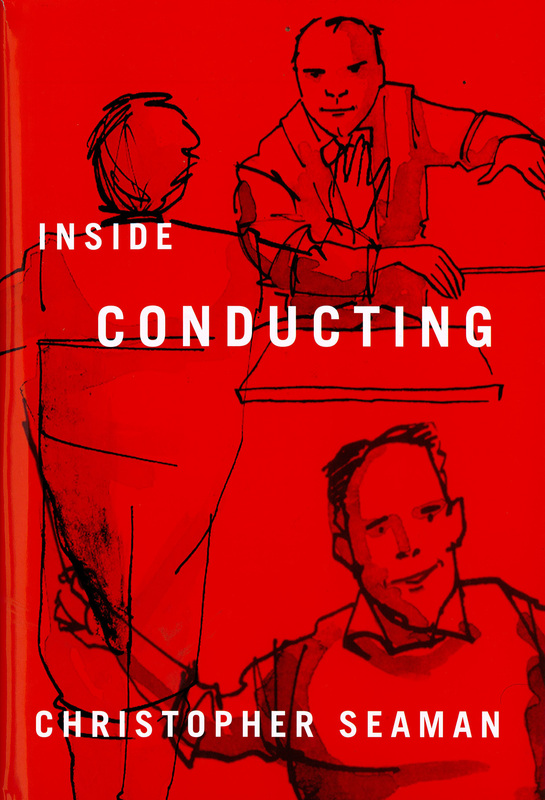 Sometimes the subject dictates the medium. Would the chillies in the image below be quite so chilliesque if they’d been drawn in pastel? 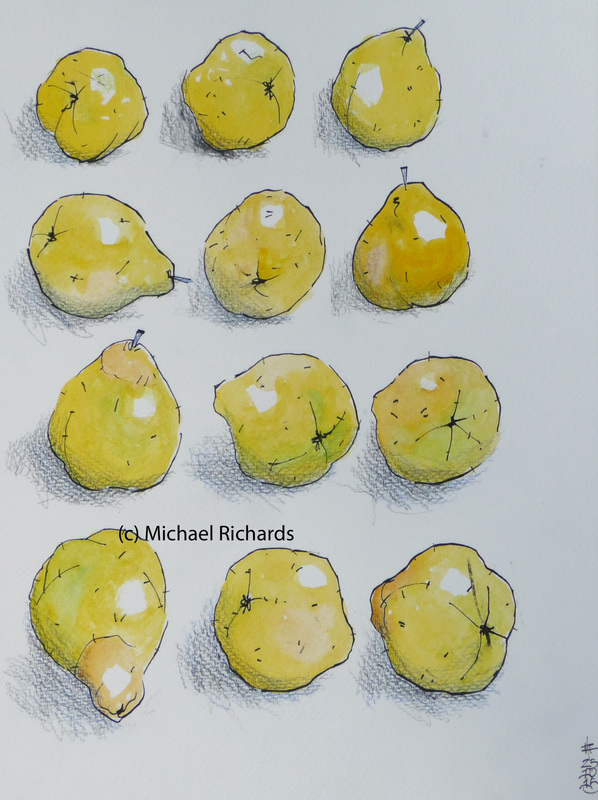 Somehow the creases in a chilli cry out for the hard line of ink, here combined with watercolour to give a rich colour that still allows the line to show through. 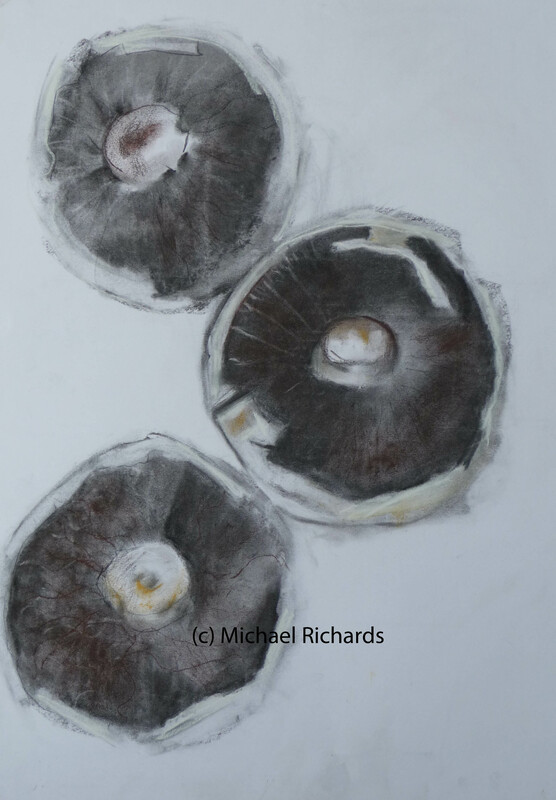 Similarly, these mushrooms – drawn a couple of years ago in Helen Gilbart’s drawing class – started off in charcoal, rubbed back to get the milky whiteness of the skin and the stalks, but needed brown pastel to produce that particular mushroom quality. 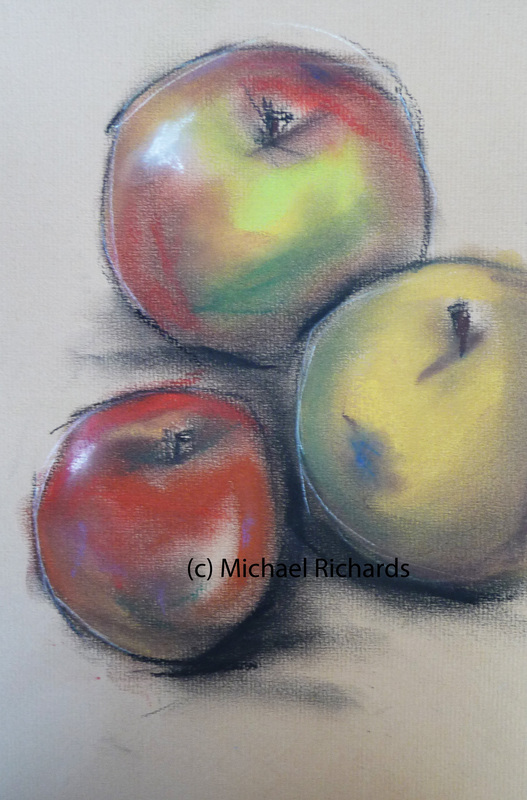 It’s a softness that pastel and charcoal achieve so well together. Cut open a green pepper and there’s almost more going on that you can take in: the seeds spilling everywhere, the colours of the flesh near the stem, the deep shadows of the mysterious interior, more shades of green than you have pastels in your box. 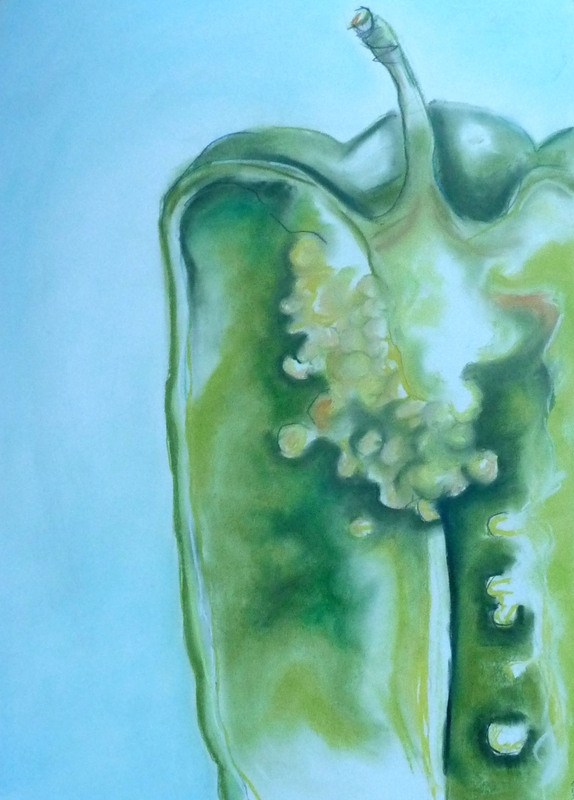 Like chillies, green peppers are endlessly fascinating things to draw.